People used to ask, how to build your first mobile app in easy steps? How to develop an android app for beginners? How to make an app for android? How to build a mobile app from scratch? Developing a phone app application for android or iPhone for free? In mobile app development sector, the Apple Inc.'s AppStore alone has earned more than $8 billion in payouts. Mobile is the new face of business and commerce today. That’s why small and medium-sized businesses also want to invest in an app. Just going to build cross-platform mobile app is not a sufficient anymore because today’s customers want to make all the transactions from their mobile devices. One of the Digital research firm reports that nearly 40 percent of American mobile subscribers purchased downloaded apps in June. A consumer survey by MTV Networks says that "91% of respondents replied that the apps reveal them to new & updated things; 77% compared apps to personal assistants, and 83% of daily mobile app users told believing they're "addicted" to apps. "- Entrepreneur. The benefit developing a phone app in business is that it expands the ways in which you can do business; location-targeting, portability, ease of access and other tech advancements can put your businesses in front of a larger audience online. However, today’s AppStore has more apps; Android users are ready to use the broad range of variety between 2.2+ million apps whereas the Apple store remained in the second position with 2+ million apps. 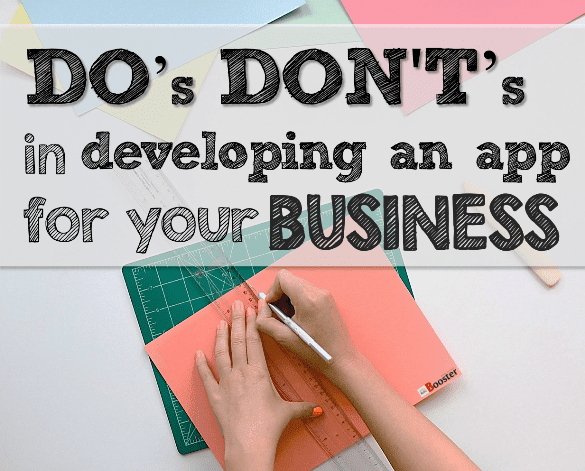 A small business app development project alone ranges from $3,000 to over $20,000 in cost. This price can be beyond the budget of an average startup. A quick question received, What are the do's and don't I need to check for developing a phone app for my business? While developing mobile apps, some important factors you need to consider that not only influence the cost of building a mobile app but also making you stand out and grow successful in the market. So start to build your mobile app with some guidelines that you must follow. In previous article we have seen, Why Online Retailers Must Focus More on E-commerce Mobile Apps and in addition to that, today we are going to check the things that you need to consider while creating mobile apps & these things also need to know for business app developers. According to research, only 2% of the top 250 publishers in Apple's App Store are "newcomers,” which means that your new app will have to compete against tech giants. 1. Decide why you need business phone app. Making business phone app seems to be the 'it' thing nowadays, but why does your business need an app? What is the importance of mobile apps in business? Don’t be a victim of ‘peer pressure,' because it isn’t beneficial when it comes to business. Have a meeting with your company’s senior management and talk about the issues/factors in your business which a mobile app can help address. If your business needs an app, but you don’t have the budget for it, then there are many ways to create that budget. Tech firms like Mobile Roadie offer their customers an option to build their own customized app for a subscription of $29 per month. Initial subscription costs are under $500. Services like these make it easy to design an app, even if you aren’t a business app developers yourself. However, you should know what your app wants to achieve in the market so you can stay on the right track. What value will it deliver to your target market? Is it going to solve any problems? You need to think about all these aspects. A good application is all about customer experience. A mobile app is where your target audience will engage with your brand. You should know what your customers are interested in. Mobile apps provide new user experiences, which the Internet doesn’t. Make use of this interface to attract people to your business. People spend time and money to download your business phone app, ensure that their efforts aren’t wasted with an awkward or unappealing GUI. Mobile marketing gives your business a wider reach. Not only can you engage with your customers, but your customers can also talk to you. Incorporating interactive and sophisticated media items, games, coupons and location-based services in your app can engage people with your business in a better way – which, in turn, can lead to an increase in sales. 3. Ensure security in your app. Just be confirmed that your app is not vulnerable to a security breach. Just because it is not available on open app network, doesn’t mean it is safe. Your corporate information, as well as sensitive user information, is at stake when you ignore security measures. Make sure that the security system is updated, and schedule maintenance and troubleshooting checks on your app. Enterprise apps can provide corporate information, so talk to your business app developers about online safety and governance. 4. Make use of mobile sensors. Most mobile devices have a front and rear camera, 3G, LTE, accelerometers, Wi-Fi and Bluetooth. Microphone and location sensors are given in any mobile device. If you can make use of these mobile sensors through your app, your users will be thrilled. Get the most out of all these sensors when designing your business phone app. Basic features like making sure the app also rotates with the tilt of the device, and more enhanced features like snapping a photo, enable the user to interact more efficiently with your app. Some businesses also implement a QR code which users can take a picture of, and get rewards. 1. Don’t apply same design to all platforms. Many businesses that are new to the mobile commerce world think that one app design can fit all devices. It couldn’t go further more from the truth because users are opening your business phone app via different devices and expecting different experiences. Rather than exporting one design to multiple platforms, you should target each platform individually and customize for that. Business apps need to have an air of standardization. Android has captured 40+ percent of the US mobile market while iPhone has 26+ percent. So, it is advisable that you make an app which runs smoothly on these two leading platforms. 2. Don't forget to make a flowchart. Don't think that the app development process is different from any other campaign. Building an app is a step-by-step process, and you should plan it out accordingly. 3. Don't go for a complex design. The cheap thing you can do to your new business phone app is to steal someone else’s interface and incorporate it into your own app. It is not only theft but also extremely unimpressive for your business. This is something which you, as a business owner, should never do. 4. Don't try to turn everything mobile. In some businesses, not every aspect is suitable for mobile. Many mid-and-back-office services might not even get any benefit from an app. By investing time in deciding what services can take advantage of a mobile app, you can make sure that you develop something which everyone can use and benefit from. Just because your competitor has an app in the market for $25 per download, doesn’t indicate that you should also put the same price for your application. In this regard, it is better to do some market research and then decide what should be the best price for your business phone app, based on your overall costs. Just like having a website was crucial for business 15 years ago, having a business phone app is essential today. It puts you out there as a strong business and gives a positive impression to customers. Article By Evie Harrison — is a blogger by choice. She loves to discover the world around her. She likes to share her discoveries, experiences and express herself through her blogs.